A lot has been written over the years about all brands of putters, but it’s the Scotty Cameron Putters that have grown from strength to strength around the globe – regardless of the asking price the brand is on the up and up! In this article we want to look at not just Scotty Cameron putters but also the likes of Ping Putters, Odyssey Putters and TailorMade Putters, as we all know putters are very much a personal preference taking into account the look and feel of the putter, the shape of the putter, the weight of the putter and the length of the putter to name but a few. With today’s choice of putter grips changing by the month, whether it be thick and short in length grip or a narrow grip, the choices are endless because it’s one part of the game of golf that most golfers tinker with, you will find that most touring tournament professionals will start on the practice day with an assortment of putters to suit the weather conditions and also the locality of the course, but by the first day of the tournament they have made their mind up what putter stays in the bag for the remainder of the tournament. The best way to get the correct putter for yourself is to visit your local golf professional shop or major local golf retailer, in their showrooms they will have an ‘eye line’ mirror, this will help you select the correct putter for your set up and also stance in comparison to where the ball is in relation to your eye line. So basically, you would line the putter and ball up on the eye line mirror, then when you look directly down to the mirror and see where your eye is located on the plate that will give you an indication of what type of putter you will need to suit your golf game. Once you have sorted out what type of putter is required then the choice of putters can be a daunting task! As with any golf club you are purchasing, you would want to try it before buying it, so ask your local golf professional or golf retailer to tape the head up so you can give it a test drive either on the practice putting green or actually use it during a round of golf, the main thing here is to ensure you take it back in pristine condition so if you don’t buy it then it looks unused for the next potential buyer. 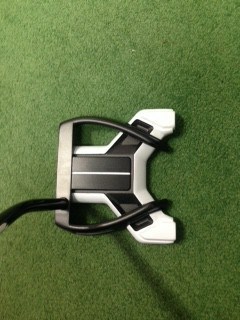 With the costs of putters today it is well worth the opportunity to try it before ‘buying’ it. This is truly one of the classic putters on the market, whether you are a Ping iron or Ping Driver user, this is a very popular brand for all standards of golfers. It has variable depth grooves which improve your ball speed consistency, which is matched with fantastic distance control and feel, which inevitably end up with more putts made per round. The back cavity insert will improve your feel and it even gives off a great audible sound when connecting with well-stroked putts. There is also an optional adjustable length shaft which helps you to get the best fit, plus with the copper finish, it makes for a good looking and distinctive look. The reason I have chosen this one is that it sort of follows the shape of the old ‘Rossie’ putter which has always been a popular putter amongst the golfing fraternity, so this new addition to the Odyssey Putter family is a must have followed up to the old relation! This premium putter is a perimeter-based mallet/head, with its double bend shaft, with the actual shaft offset it has a very pleasing to the eye feel about the putter. 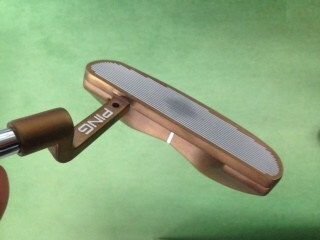 The attractive inserted plate on the putting face gives a nice feel and roll when a putt is struck. With so many touring professionals plumping for this style of putter I felt that at least I could do is give it a once over and give you my thoughts! 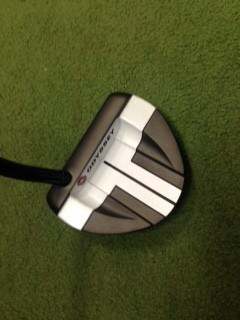 Firstly the Daddy Long Legs is available in 2 lengths, that being 35 and 38 inches, so it is crucial to get the correct length of shaft initially, TM say that if you normally play with a 33 inch putter then the 35 inch is for you and if you normally play with a 35 inch then the 38 inch is perfect for you. It is recommended that allow for at least 2 or 3 inches to be above your hands/grip to give it the best counterbalance it has been designed for, plus the counterbalancing will help you roll the ball more accurately. In my opinion, this is one of the best Scotty Cameron putters to hit the market, enabling you to get those bad thoughts out of your head about angles, breaks and lines, this is the one putter that really is about the look and feel, its how you feel looking down the shaft and getting lined up, it sort of feels like an extension of your arm at times! With its aluminium sole plate and customised weight technology, it’s a joy to have a roll with this preferred choice of so many touring professionals. 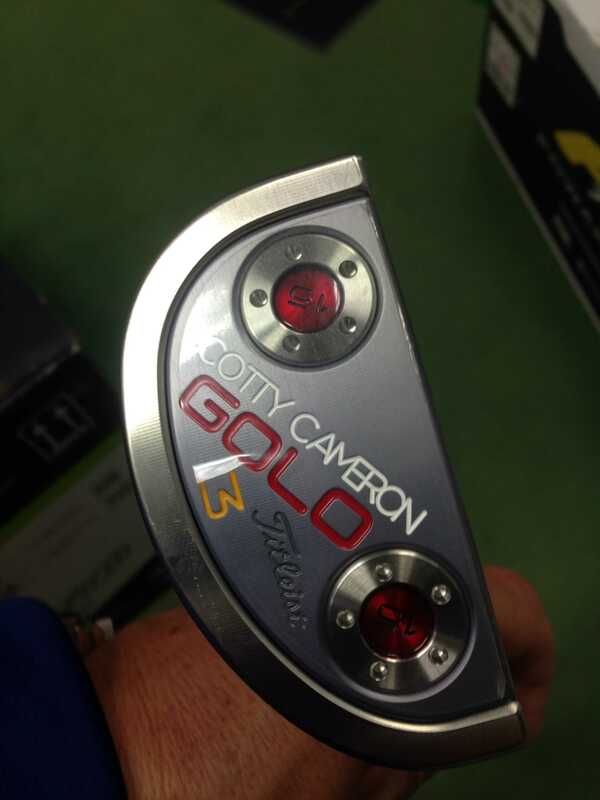 As with the Scotty Cameron putters marketing campaign, Go with the flow has never been meant so literally! For another post on putting and tips CLICK HERE. 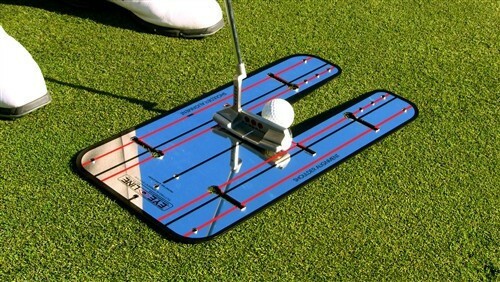 For more information on putters CLICK HERE. There are of course many hundreds of different golf putters on the market, so it would actually take a lot of time just to give a quick oversight on them all, thus this is the reason I chose just a few that I could try out, have a putt and give you my feedback. As always if you have any feedback please feel free to leave a comment below, I would be more than happy to respond back to you in a timely manner.